Numerous variations of the wan motif can be found in Chinese lattice work design. In our specimen, the craftsman softened the sharp angles of the interior lattice work with rounded corners and convex surfaces on the railing frames: a technique that, with the coiled dragons, has both a pleasing and soothing effect. We believe this canopy bed was made in the Suzhou district, known for refined and exquisite furniture craftsmanship during the Ming and early Qing periods. 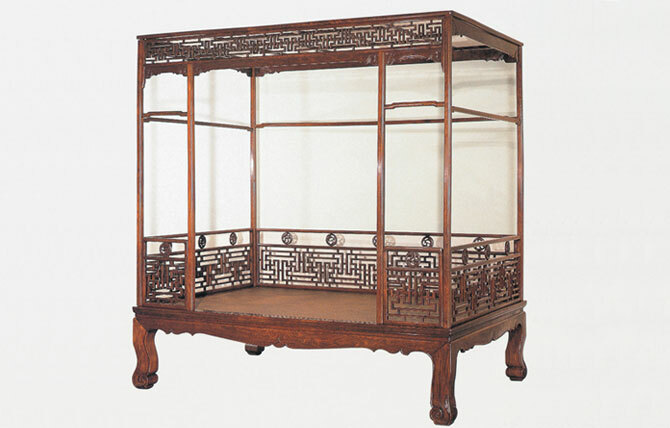 Another Ming Dynasty Huanghuali Wood Six-Post Canopy Bed with wan motif railings and cabriole legs can be found in The Palace Museum, Beijing, and is also illustrated in Wang Shixiangs’s Classic Chinese Furniture Plate 126. Please compare the slightly different wan motif lattice work design with our bed. This Canopy Bed can now be viewed at the Detroit Institute of Arts.